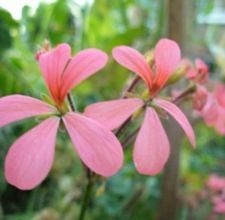 Originating in South Africa, the ivy geranium (genus Pelargonium, species Peltatum) bears delicate five-petaled florets in colors ranging from white, light pink and hot pink to magenta, purple and scarlet. As its name indicates, the plant has a trailing habit with ivy-shaped leaves, suiting it well to hanging baskets and window boxes. Perhaps the worst problems that can afflict these decorative plants are those that keep the buds from opening. The geranium budworm (Heliothis virescens), or tobacco budworm, is a tiny caterpillar that bores into the flower bud and eats away, hollowing it out. If the flower manages to open, it is riddled with holes. On affected plants, you’ll see tiny holes in unopened buds. Difficult to see, the worms are about 1/4-inch long, have light-colored stripes running the length of their bodies, and take on the color of the part of the plant they’re eating–they also eat flowers and leaves. You may see evidence in the form of tiny brown/black pellet-like droppings on the leaves. These caterpillars are considered warm-weather, subtroptical pests because the pupae do not survive temperatures below 20 degrees Fahrenheit. However, the caterpillars are active in commercial greenhouses and can thus make their way into northern gardens. And the pupae can survive in potted plants brought indoors for the northern winter. Beginning with simple measures, handpick from plants any worms or eggs you’re able to see and remove affected buds, leaves or flowers (or entire plant). For heavy infestation, you may need to apply an insecticide; however, the geranium budworm is notoriously resistant to insecticides. One natural remedy is Bacillus thuringiensis, known as Bt, a bacterium that kills the caterpillar but is safe for animals, humans and other insects. Available in powder or liquid form, Bt kills the worms in about 72 hours. However, its effectiveness is limited, as worms already inside buds are not likely to ingest the product. Many re-applications will be required; it has no residual effects. Unfortunately, natural pyrethrins–derived from different species of chrysanthemum–are not effective on these budworms. Synthetic pyrethroids, such as Talstar and Scimitar, have been found most successful in combatting the worm. According to the University of Florida IFAS Extension, pyrethoids are "one of the least accutely toxic insecticides to mammals." Overwatering–contrary to what you may think–causes buds to dry up and fall off before flowering. Excessive heat and humidity can keep buds from opening. 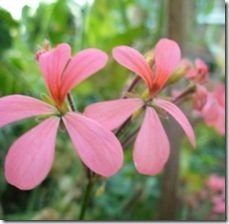 Unlike other pelargonium species, the ivy geranium does not thrive in temperatures above 85 degrees Fahrenheit and high humidity without afternoon shade. Overfeeding, while it promotes vigorous leafy growth, can keep buds from flowering. Botrytis (Botrytis cinera), or grey mold, is caused by air-borne spores. It can damage the entire plant, including causing bud rot. The spores germinate upon contact with wet foliage and thrive in high humidity (above 85%). To keep your ivy geraniums free of botrytis, be sure not to overwater them. Water early in the day (before noon) rather than at night so that moisture will be evaporated rather than linger on foliage. Keep plants nicely spaced so air can circulate between them. Regularly remove dead flowers or foliage or other debris. For botrytis-infected plants, remove all areas that are affected. To help control it, apply copper or sulfur based organic fungicides. To promote full flowering of your ivy geraniums, provide optimum cultivation. Make sure soil is well-draining and plants are well-spaced to promote air circulation. Monitor watering needs and keep foliage dry overnight. Avoid over-fertilizing–applying compost regularly is all you’ll need to meet nutrient needs.